Motor Girl is Samantha, a veteran with three tours and a year of imprisonment as a POW behind her. 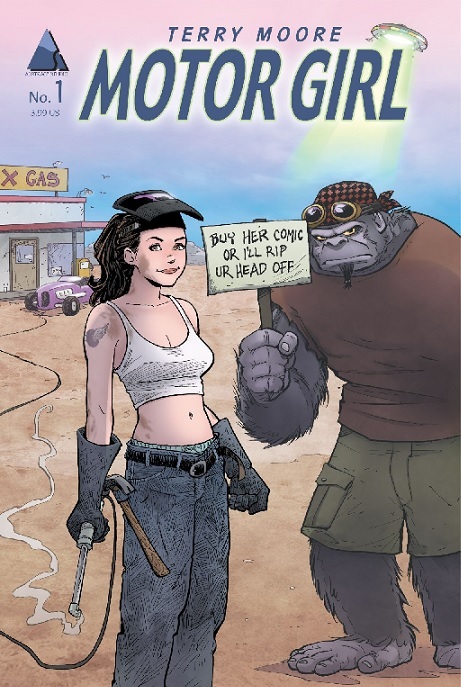 She’s the mechanic/keeper of a junkyard in the desert owned by Libby, and her only constant companion is Mike, a sentient gorilla who dresses like my college-aged nephew. Mike is her friend, sounding board, and protector, and Sam might be the only one who sees him. Oh, and in this first issue, a UFO crashes in her junkyard, and she fixes them up before they fly off again. That one, she’s pretty SURE really happened. 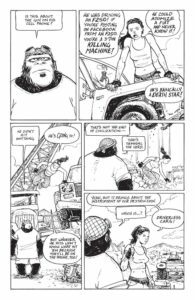 Before the amazing Rachel Rising, before before Echo, before appearances scattered like gems in other comic books, Terry Moore once created an amazing book called Strangers in Paradise. It’s the story of two girls who are best friends, and their sometimes really normal, sometimes really fantastic lives. Terry’s recent books have had moments of levity, but neither Rachel’s living dead issues nor Echo’s liquid armor wanted by the government allowed for a lot of just FUN moments. Strangers in Paradise and moments that literally made me laugh out loud, and not the faint smile accompanying a LOL when I’m online. 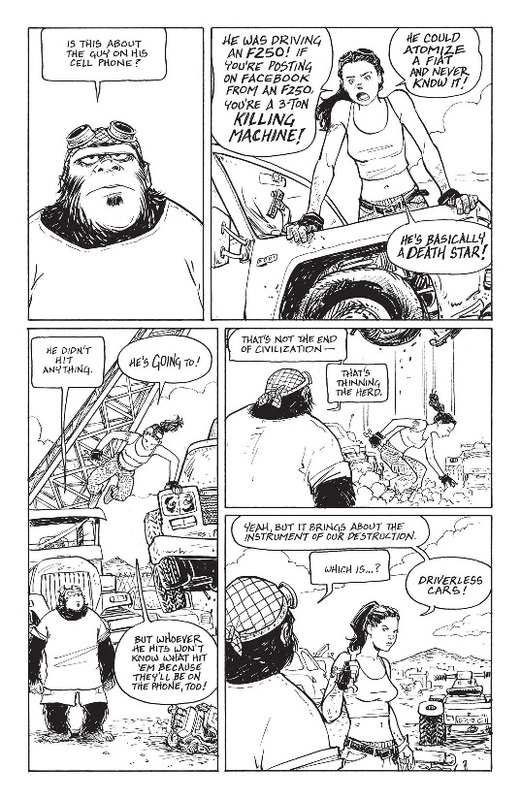 Motor Girl hearkens back to the early days of SIP, where some very serious issues were surrounded by the up & down and often ludicrous & laugh-worthy lives of twenty-somethings. 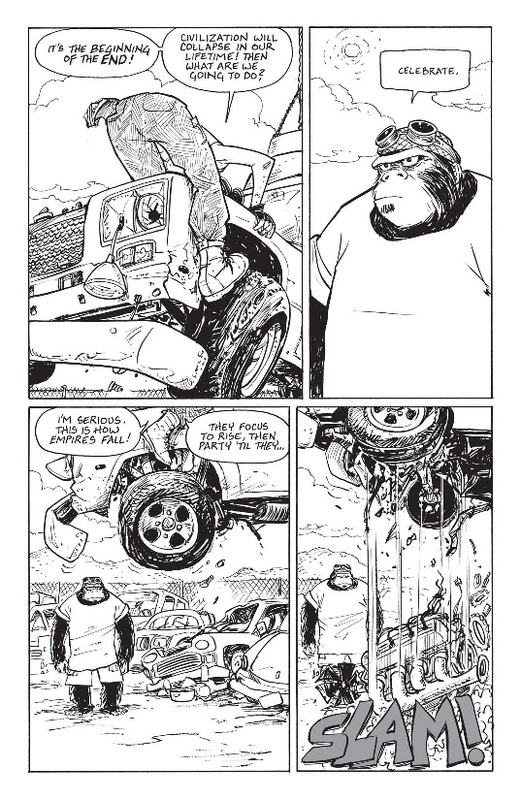 Terry Moore is a great over-all storyteller. He knows vulnerability and pain and coping. His characters look like people, not heroic bodies of ultimate perfection. They move like people, fall disgracefully, and pick themselves up again. New issues cannot come out fast enough, because I need to learn more about Sam and see how she copes with life, aliens, and a possible hostile takeover of her business. Sam’s opening rant to Mike made me smile, and I just never stopped smiling. The smile stayed on my face after I closed the back cover. This is a Must Read.